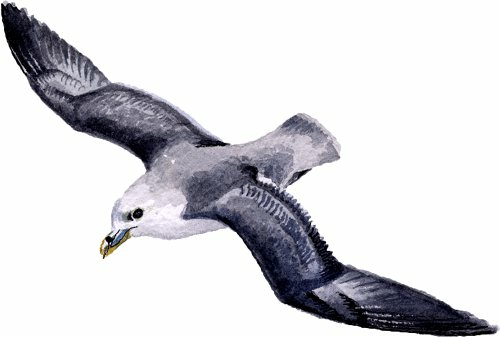 GigaDB Dataset - DOI 10.5524/101025 - Genomic data of the Northern Fulmar (Fulmarus glacialis). Genomic data of the Northern Fulmar (Fulmarus glacialis). The Northern Fulmar (Fulmarus glacialis glacialis (Linnaeus, 1761)), also known as Fulmar or Arctic Fulmar, is a highly abundant sea bird and commonly found in north Pacific and north Atlantic subarctic regions. It is a member of the Procellariidae family, which include petrels and shearwaters, and like other petrels, the Northern Fulmar's walking ability is limited but is a very a strong flier. These data have been produced as part of the Avian Phylogenomics Project. DNA was collected from a vouchered sample (137838) of Natural History Museum of Denmark from a male caught in Denmark. We sequenced the genome to a depth of approximately 33X. The assembled scaffolds of high quality sequences total 1.14Gb, with the contig and scaffold N50 values of 17kb and 46kb respectively. We identified 14,306 protein-coding genes with a mean length of 12.8kb.